Joel R. Brandes lives in Fort Lauderdale, Florida with his wife Elizabeth. He is the author of Law and the Family New York, 2d (9 volumes), and Law and the Family New York Forms, 2d (5 volumes) (Thomson Reuters Westlaw). He writes the annual updates to Law and the Family New York, 2d, and Law and the Family New York Forms, 2d with his daughter Bari Brandes Corbin, Esq., and his son Evan Barett Brandes, Esq. Mr. Brandes is an acknowledged expert and authority on New York Divorce and Family Law. He has authored more than five hundred articles that have been published in legal journals. When he practiced law in New York, his practice was limited to matrimonial litigation, trials and appeals, and he authored “Law and the Family,” a regular monthly column in the New York Law Journal. During that time he co-chaired the Continuing Legal Education Committee of the New York State Bar Association, Family Law Section and lectured on all aspects of matrimonial and family court practice to attorneys throughout the state. Mr. Brandes writes and publishes Bits and Bytes, ™ an electronic newsletter for the New York divorce and family law bench and bar, and New York Divorce and Family Law at www.nysdivorce.com. 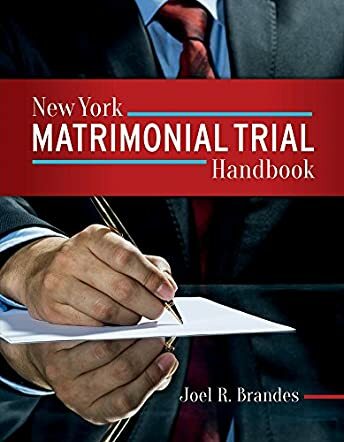 New York Matrimonial Trial Handbook by Joel R. Brandes is a ground-breaking tool for matrimonial lawyers and attorneys, a powerful legal reference for courtroom trial, designed to help counsel anticipate surprises that can happen during a matrimonial trial, ask the right questions to parties and witnesses, and successfully handle the trial to a satisfying outcome. The book offers tons of information, strategies, tools, cross-examination questions, and scenarios that can help the attorney take control of the case from the moment it gets to court. The reader will get a great understanding of how to conduct a trial, how to establish a prima facie case by being intelligent with questions and getting a divorce, annulment, or separation granted, how to get the court to rule in favor of maintenance and child support, and how to arrive at getting an equitable distribution of marital property. Divided into five parts, this book covers procedural law and the law of evidence, uncovering nuances and implications that can make or mar a case. The reader is left in no doubt that it is written by an expert who has been in the courtroom for many years and who demonstrates an unusual mastery of matrimonial law and court proceedings. The book is written in a clear, easy-to-understand style and structured to allow readers to easily navigate to the part they need most. The legal references are concrete proof that the author knows what he is talking about and he presents the information with authority and confidence. I also enjoyed the wonderful examples and the sample questions that are included. For anyone involved in matrimonial lawsuits, New York Matrimonial Trial Handbook would be the first step towards a satisfactory outcome. Joel R. Brandes leaves no doubt in readers' minds that he is an authority in this area of study and offers a winning tool to his peers. A must-read for any matrimonial lawyer.